It’s April Fools Day, and I’m back; but does that mean this is not a real post? Is this an April Fools prank? Or, is this a legitimate post? Hmmm….it’s a bit of a quandary…I mean; this is a post, so it is real but it could be a joke. We’re in a bit of a logic loop here which leads right into today’s discussion of: loops and samples. The term samples has many implications and usages within music production. Sampled instruments, voices, and orchestras are available in software, such as Kontact, and UVI workstation for PC/Mac, and iSymphonic Orchestra and Sampletank for iOS as just a few examples. 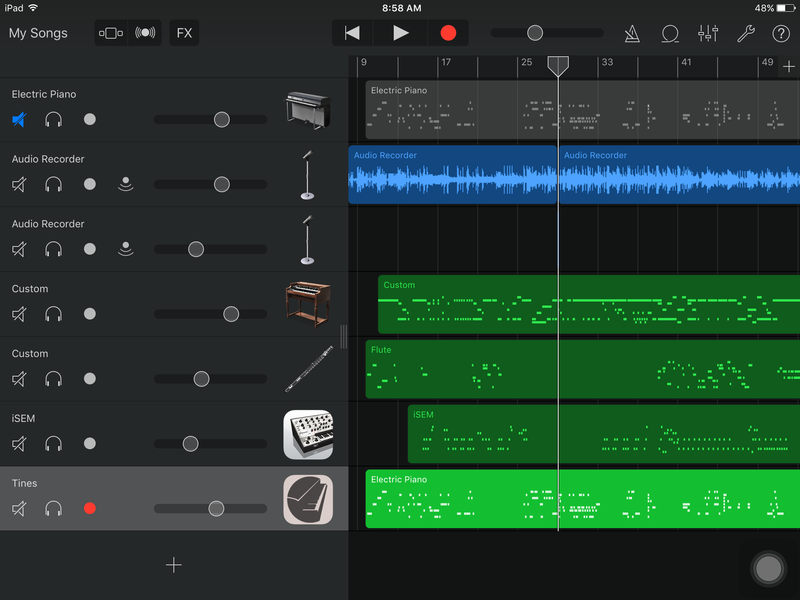 In this blog entry I cover some different aspects of using samples and loops in my music creation on iOS devices. One use of sampling is for copying a section or a beat from another piece of music to use in a new creation. This can get into legal territory about ownership and thus I will avoid that side of things. That, and I don’t really use this technique in my own music creations and have no further insights therein. As samples and sampling can have different meanings so can the terms loop, and looping. Live Looping is a form of loop based music that is created on-the-fly using technology to record and play back phrases in real-time to build up a song. We have several tools for this on iOS, such as the app Loopy HD, from A Tasty Pixel. Although I have tried, I have yet to have a successful go at this technique of music making. Live Looping is an art and skill that I admire and may revisit one day. Pre-recorded loops can be created with samples, or programmed and sequenced. They are repeating parts of instruments, vocals, or sounds. Typically loops are short sections from one to four bars, but may also include one-shot samples, like a drum hit or cymbal crash. There is a large commercial market for loops with several fine vendors and many on-line sources for free loops as well. On iOS we can find several apps that offer or feature loop playback (via clip launching), such as: Blocs Wave, LaunchPad, and iMachine. 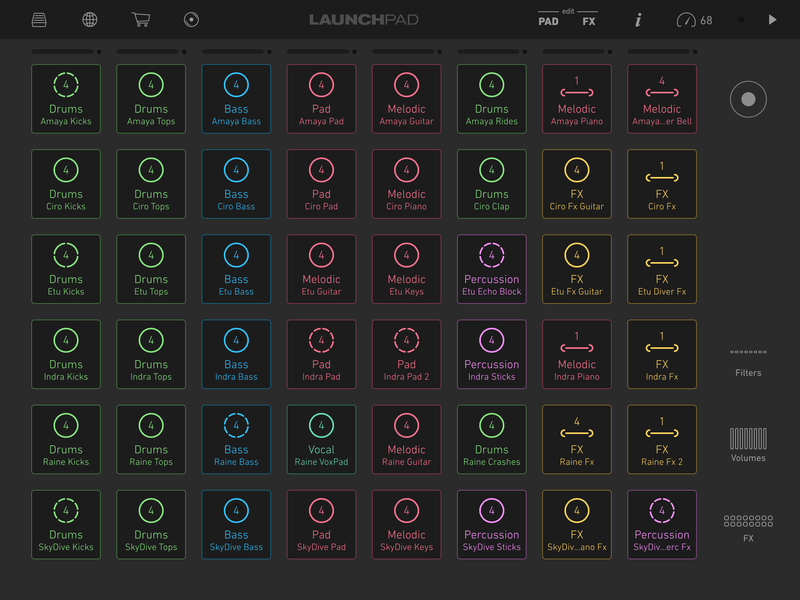 My first experience with using pre-recorded loops began with the Launchpad app from Novation. The app is a software emulation of a hardware device where different sounds are pre-loaded and played via rows and columns of buttons. 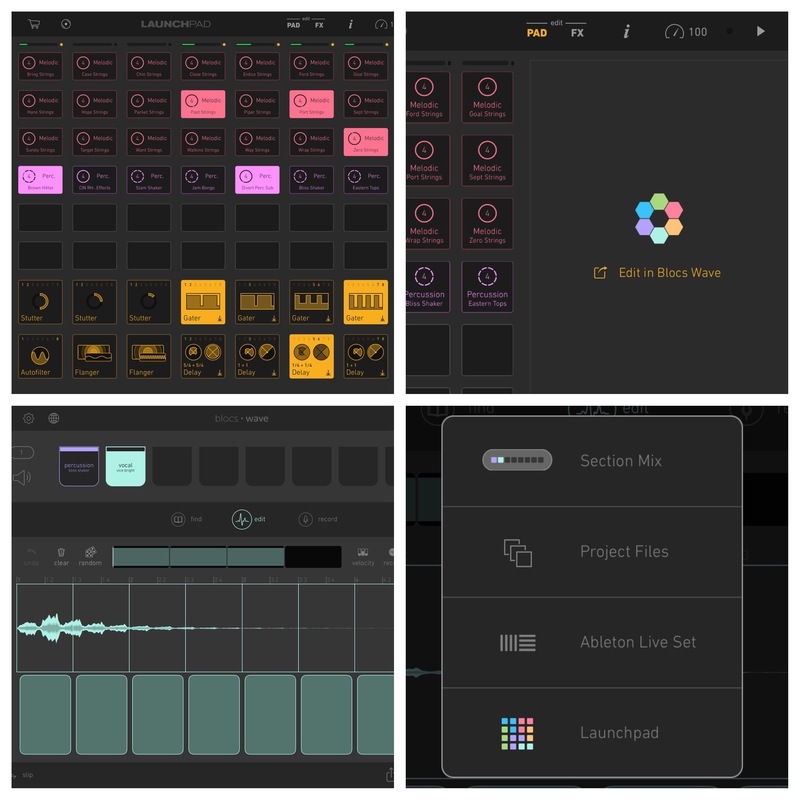 Soundpacks for the app come as groups of related sounds and beats that can be played in a sort of DJ style of music creation via 48 buttons (loop playback in this case can also be called clip launching, hence the launchpad name). The LaunchPad app has evolved very nicely over time to become quite sophisticated. Features offered as In App Purchase (IAP) include: import user created loops, and per channel real-time effects. These provide for very playful arena. I find it quite fascinating to rearrange and play with the fantastic sounds of the commercial packs, and to populate the playing surface with my own sounds too. 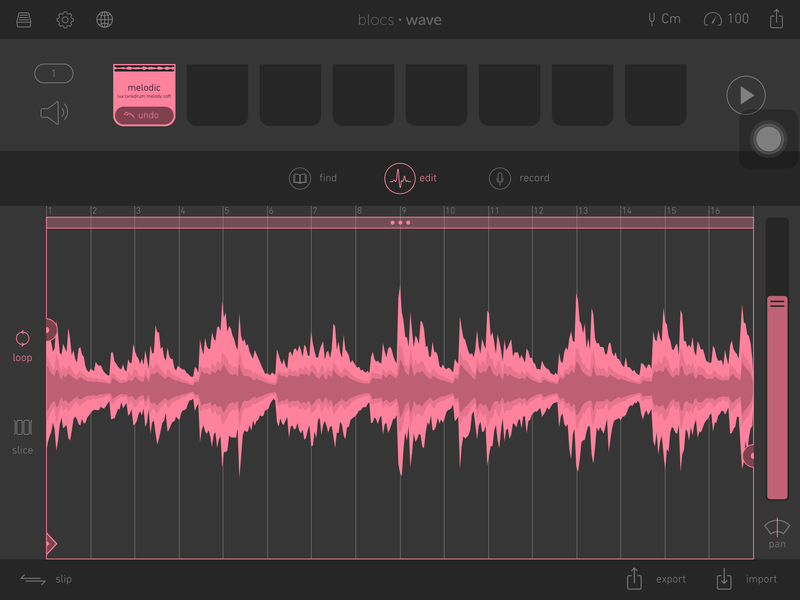 Blocs Wave, also from Novation, is a sample editor and player app that can work seemlessly with the LaunchPad app. This has opened the door even further, allowing for time stretching, key changing, and slicing of samples. These can be arranged in any desired order and then exported into Launchpad where the excellent effects can be used as your performance is recorded. Using pre-made sound clips (someone else’s music creation) can feel like cheating, or it did to me at first. But LaunchPad and Blocs Wave are so much fun to play and allow for a lot of creativity in sound manipulate that one soon finds that the finished result can be quite different than the original. With Launchpad, some of the work (or drudgery) of music creation is removed and we are allowed to just dive into some pure creative fun. Recently I have expanded on that fun factor and incorporated some work to allow for more than just a tune made from other’s remixed parts. With this method, I play my own music parts on top of a loop based tune so that the whole piece is infused with new sounds which were inspired by the original Launchpad clips. That is self referential, which is another type of loop, but let us not go down that rabbit hole of thought. My previous album “Dreams” and my upcoming album release both include some Launchpad based songs with additional sounds. It was easy to do, and there is more than one method, but I’ll step through what worked for me. Once I had a desired performance recorded into Launchpad (mostly drums and effects sounds), I then imported the track, via audio copy, into GarageBand (Using GB here as example, but I could use any capable DAW such as Cubasis, Auria, or MusicStudio). Inside GarageBand additional instruments parts were added either from the built in sounds, via Audiobus, Inter-App Audio, or by using the newer Audio Units feature. By using any or all of these input combinations I have many sound choices available. I should add that in Garageband’s iOS 9 update, Apple added some Launchpad type of loop playing functionality, and while it is a nice addition, the LaunchPad app has many more features (and Soundpacks) and so I prefer to use that. For the Launchpad Soundpacks, Novation provides the musical key and beats per minute (BPM) information so that can be set up as needed beforehand. GarageBand is especially helpful with this since the song and the instruments can all be set to the proper time signature and scale thus helping to keep everything in time and in tune. With the imported audio on one track, I can then experiment by adding more tracks with various sounds that are inspired by the existing track. To me, it feels like somewhat of a collaboration, though from an unnammed source. And while I can make and import my own custom sounds into LaunchPad and record a complete performance there, I have found it more inspiring to create in LaunchPad first and expand upon that in a DAW. Most of music that I create is made in pretty traditional fashion, recording one track-a time-time, but getting into using loops has opened up new creative avenues — and no, it does not feel like cheating. She is awesome…multi-talented and with her command of the cello and of live-looping. Cool that you got to see her.